Homicide, a Zionist holy war: The 22-day sadistic Israeli Assault on Gaza which ended up with flowing rivers of innocent blood of 108 women and 437 children isn’t a deviation of the Zio-Nazi mainstream terrorism in the region, The Israel of Operation “Cast Lead” is still the Israel of 1948 Plan Dalet, under which 840,000 Arabs were expelled from more than 530 Palestinian Villages and towns. 15,000 of them were ethnically cleansed adding 20,500 square Km to the Zionist occupied land. Like a jigsaw collecting piece after piece to complete the ugly picture of a so-called Promised Land for the Jews, hiding behind their holy scriptures interpreted by ill minds and worldly whims. Israel of Operation “Cast Lead” is still the 1948 Israel of massacres; of Deir Yassin where in all over 100 men, women, and children were systematically murdered. Fifty-three orphaned children were literally dumped along the wall of the Old City; of Sabra and Shatila where 1,500 Palestinians were massacred under the watchful Eye of Ariel Sharon, the Defense Minster back then. Who entered with his cursed Zionist feet into Al-Aqsa Mosque and provoked the Intifada (up-rising) of Al-Aqsa in 2000; Still Israel of more than 50 documented bloody massacres committed over 60 years of occupation. Israel remains Israel of defilement, Terror, Massacres and malignant merciless policies towards the Palestinians, but what really grasped my attention in the latest Israeli assault wasn’t the Gaza war crimes but the dramatic changes and major turns from friends rather than foes. From family rather than enemy. 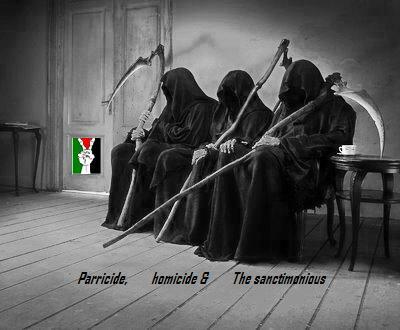 Parricide, an Arabic Backstab: In 1948 as soon as Tel-Aviv announced the establishment of an official Jewish state in Palestine. Egypt, Lebanon, Jordan and Syria gathered forces and tried to face such budding Zionist threat with military might before it spreads likes cancer in the region despite it ended with a ceasefire the year after, it certainly proved that the word “dignity” used to exist in the Arabic dictionary back then. Unfortunately, regarding Arab Patriotic, heroic moves history doesn’t repeat itself. For more than thirty-five years now, with every Israeli demoniac move in the region we find the very same scenario happens. Israel acts, Arabic Street watches, Arab leaders talk and the western world enjoys the show. Every Player performs his normal routine. In the Arabic world of today, such humble and meek actions don’t even exist. “Enough is enough. The situation is going to change,” and that Israel will “change the reality” of the situation in the Gaza Strip. Hearing this kind of statement given out from an Israeli official in an Arabic capital without even hearing a direct counter-reply from the Egyptian side only meant one thing that the sequel of events and responses from the Arab side will be much more different this time and things going to get much worse. Absolutely, Leaders of the Middle East understands that the only winning card to polish their pictures in front of the Arabic street is Palestinian. Hizbullah has used this card pretty well with some furious speeches to achieve Iran’s hidden agenda to gain the loyalty of the Arab street. Qatar drove a hard bargain as well to save face after the long shameful co-operation with the United States against Iraq. Trying to show the world it’s hard thriving to make all Arab leaders sit together around a single table, acting innocent. Egypt decided to blow this humble summit not only by declining the invitation but also preventing Mahmud Abbas (The Palestinian President) from attending. Since Egypt realized that it’s so-called leading role and its political throne in the region is in jeopardy since other leaders began to start other peace initiatives stepping Egypt aside. Kuwait decided to sell stocks of Palestinian blood in the Arab economic summit after more than 20 days of the assault. Saudi Arabia along with Egypt claimed that a summit is useless and it’s time to act, but eventually their actions were much more worse than attending a Summit. What I find ironic is to see frontline articles in Egyptian national newspapers that without the help and wise actions from the Egyptian side, things would have gotten much worse in Gaza and it was Egypt, and Egypt alone, who ended the Israeli Assault with it’s wells of wisdom, patient and skillful diplomacy. The Cease-fire didn’t end with the Egyptian initiative but with the U.S.-Israel agreement to condemn any pockets of resistance in Palestine. On the other side of the Red Sea, We see Qatar greeting its King as a Conqueror who came from a Victorious Battle, only because he called for an urgent Summit, talking to the press of how stubborn Arab leaders are, as soon as a leader agrees to attend the summit another declines. With all this Propaganda giving me the feeling that all praise shall be given to Qatar for ending the Arab/Israeli Conflict that existed for decades! Neither the Conflict ended, nor Qatar did add anything to this Issue. In the end of the day, we are witnessing a Parricide committed towards Palestine by the hands of its siblings. Sanctimonious, Uncle Sam: Definitely, Israel failed this time to imitate her elder brother Uncle Sam, the United States kept on throwing the same winning card (war on terrorism) on the “international community” table for over 6 years. Still winning with it the blessings of the Western world to bully around the world, doing whatever it likes whenever it likes. Israel thought it can use the very same card, to justify the Gaza offence as they are fighting terrorism exactly like America, thinking that this will pass quietly and smoothly with the help of the World’s bully to shut ever mouth with a “Veto” tape in the Security Council. So, it was not surprising to see the IDF spokesman calmly answers the question of weather Israel is using illegal Weapons like D.I.M.E (Dense Inert metal Explosives) and WP (White phosphorus) in Gaza with such words “IDF is not using any weapon that has not been used before by the United States on its war on terrorism”. Still the United States sets a perfect example of the Sanctimonious showing the world how great values it conveys to the third world, and how it is an excellent example of the free world. Still remains ugly from the inside. The winning American “war on terrorism” card didn’t quite fit well in Gaza war, this time War Crimes, Genocide and ethnic cleansing were broadcasted on many non pro-Zionist media witnessed by the whole world in such a way neither Israel nor the US could control. In the end of this tragedy “parricide, homicide, and the Sanctimonious” which was preformed at Gaza theater this time. And after the curtains fell, we shall say to the international legality “Rest in Peace” and to inform the three actors of this play that “Tiochfaidh ar la” which means in Irish, “our day will come”. Sameh is a 23 years old training surgeon in Orthopedics. He just started Article writing as soon as he graduated from medical school this year. Sameh’s main interests lie in political and “Sarcastic Comedy” articles, currently writing comedic articles called “Living in the Republic Series” discussing daily problems facing Arabs in the middle east. He is now living in Cairo, Egypt.